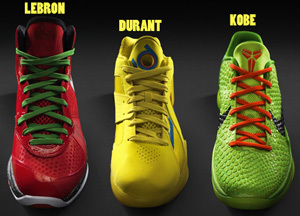 On Saturday (Christmas), Nike spokesman Kobe Bryant, LeBron James and Kevin Durant debuted special Christmas versions of their latest signature shoes. 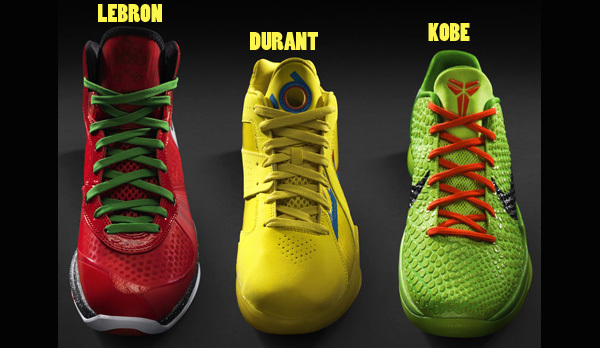 On Sunday, the trio of bright and flashy shoes were made available to the public for purchase. To some, the shoes are pretty ugly, to those who like odd and imaginative things, the shoes are interesting to say the least. Imagine if Dr. Seuss had drawn/written "The Grinch" using neon green paint, that's the best way to describe Kobe's Christmas Day Nike shoes. As a fan of all things neon green, the Kobe's are pretty cool looking. 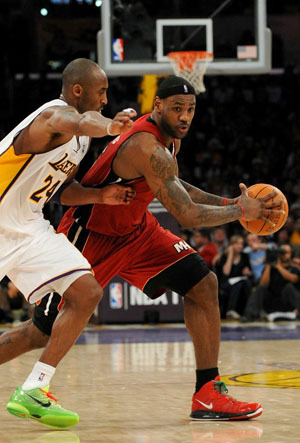 Kobe's Lakers may have lost their Christmas Day match-up versus the Heat, but I thought Kobe's shoes won the shoe showdown between Nike's top two shoe salesman. The LeBron's on the other hand look like the type of shoe that should only be worn during the holiday season, as the crimson red and dark green color scheme immediately invokes thoughts of festive front yard holiday scenes. Fortunately, other colored versions of LeBron's Nike 8 V.2 will hit retail stores on January 8th, 2011. The third and final limited edition Christmas Day shoe was worn by the league's most underrated superstar, Thunder scoring machine Kevin Durant. The "KD III" shoes feature a bright yellow color scheme with blue highlights and a touch of orange. Like the Kobe's, the shoes are extremely bright, bold and are probably best suited for those with a taste for things odd and flashy.